Home / herbs / What’s all the buzz about herbal teas? The days are starting to get shorter and naturally the nights longer and the weather has been getting colder. My usual hot drink of choice has been coffee and Starbucks when I can get it. Second has usually been black tea. But, several months ago I wandered into Tevana in a local mall and was blown away by all the different herbal teas that lined the shelves as well as the usual black and green teas. I bought a variety of teas to try that smelled awesome made with various blossoms- fruit peels and other herbal additions. I decided to do some research on herbal teas myself. I know herbal teas are better for you as opposed to caffeinated hot drinks. Drinking herbal teas are as good as drinking water to hydrate your body and different herbal teas can have added medicinal benefits. Herbal Teas are actually an infusion of the herbal seeds, flowers, leaves in hot water. I love the loose teas made in a pot. The herbs are so warming and add that wonderful scent to the air. I wrote about the benefits of using chamomile herbal tea in soap and skin care products this past week here. Drinking Chamomile Tea has many benefits also. Just as the Essential Oil can help soothe one’s nerves, Chamomile Tea can also relax you body and soul, can promote sleep, and relieve anxiety and irritability. Chamomile Tea is made from the flowers and smells awesome and comforting. 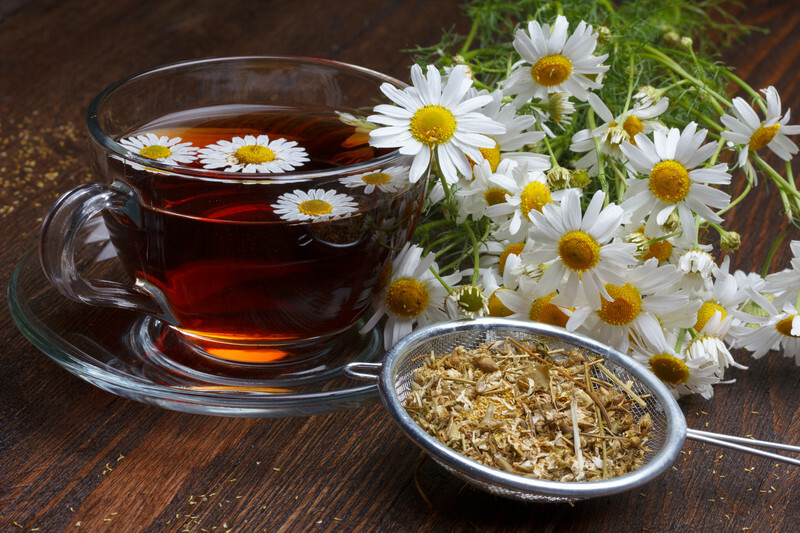 Chamomile Tea can also help with indigestion and soothe the stomach. Another great tea to help with stomach upsets like nausea is Peppermint. This herb makes a tasty tea that also helps with bloating and muscle spasms. I also read that drinking Peppermint is not good for those with heartburn. Have you tried drinking herbal tea in addition to coffee or black tea? Pumpkins and Pumpkin Bread and More! Love my herbal teas. I enjoy them daily. Loved reading your story of origins. thank you! What is really cool is that my granddaughter has really gotten into herbal teas and wants to learn how to make them! Awesome stuff! What a beautiful picture. I love Chamomile Tea, so soothing and warm on a cold day. Thank you- yes love Chamomile. This is so good you are informing about the healthful benefits of herbal teas. I drink an herbal tea daily. Right now I am drinking an adaptogen tea with hibiscus, rose, spearmint, sage and sarsaparilla.